Garnet paragneiss, Nuvvuagittuq Greenstone Belt, Canada. 4.28 Ga old: the oldest known Earth rock of which direct samples are available. Eoarchaean (3.8 b.y.) 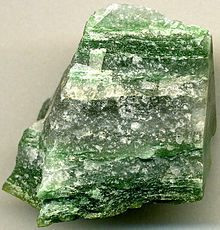 Greenlandite specimen (fuchsite-quartz gneiss), Nuup Kangerlua, Greenland. The Eoarchean ( /ˌiːoʊ.ɑːrˈkiːən/; also spelled Eoarchaean) is the first era of the Archean Eon of the geologic record for which the Earth has a solid crust. It spans 400 million years from the end of the Hadean Eon 4 billion years ago (4000 Mya) to the start of the Paleoarchean Era 3600 Mya. The beginnings of life on Earth have been dated to this era and evidence of cyanobacteria date to 3500 Mya, just outside this era. At that time, the atmosphere was without oxygen and the pressure values ranged from 10 to 100 bar (around 10 to 100 atmospheres). The Eoarchean was formerly officially unnamed and informally referred to as the first part of the Early Archean or Paleoarchean Era, both now obsolete names. The Eoarchaean's lower boundary or starting point of 4 Gya (4 billion years ago) is officially recognized by the International Commission on Stratigraphy. The name comes from two Greek words: eos (dawn) and archaios (ancient). The first supercontinent Vaalbara appeared around the end of this period at about 3,600 million years ago. A characteristic of the Eoarchean is that Earth possessed a firm crust for the first time. However, this crust may have been incomplete at many sites and areas of lava may have existed at the surface. The beginning of the Eoarchean is characterized by heavy asteroid bombardment within the inner solar system: the Late Heavy Bombardment. The largest Eoarchean rock formation is the Isua Greenstone Belt on the south-west coast of Greenland and dates from 3.8 billion years. The Acasta Gneiss within the Canadian Shield have been dated to be 4,031 Ma and are therefore the oldest preserved rock formations. In 2008, another rock formation was discovered in the Nuvvuagittuq greenstone belt in northern Québec Canada which has been dated to be 4,280 million years ago. These formations are presently under intense investigation. 3,850 million years old Greenland apatite shows evidence of 12C enrichment. This has sparked a debate whether there might have been photosynthetic life before 3.8 billion years. ^ Mulkidjanian, A. Y. (2009). "On the origin of life in the zinc world: 1. Photosynthesizing, porous edifices built of hydrothermally precipitated zinc sulfide as cradles of life on Earth". Biol. Direct. 4: 26. doi:10.1186/1745-6150-4-26. PMC 3152778. PMID 19703272. ^ Mulkidjanian, A. Y.; Bychkov, A. Y.; Dibrova, D. V.; Galperin, M. Y.; Koonin, E. V. (2012). "Origin of first cells at terrestrial, anoxic geothermal fields". Proc. Natl. Acad. Sci. USA. 109 (14): E821–30. Bibcode:2012PNAS..109E.821M. doi:10.1073/pnas.1117774109. PMC 3325685. PMID 22331915. ^ Mulkidjanian, A. Y. (2011). "Energetics of the First Life". In Egel, R.; Lankenau, D.-H.; Mulkidjanian, A. Y. Origins of Life: The Primal Self-Organization. Heidelberg: Springer Verlag. pp. 3–33. ISBN 978-3-642-21625-1. ^ O'Neil, J.; Carlson, R. W.; Francis; D.; Stevenson, R. K. (2008). "Neodymium-142 Evidence for Hadean Mafic Crust". Science. 321 (5897): 1828–1831. Bibcode:2008Sci...321.1828O. doi:10.1126/science.1161925. PMID 18818357. ^ David, J.; Godin, L.; Stevenson, R. K.; O'Neil, J.; Francis, D. (2009). "U-Pb ages (3.8–2.7 Ga) and Nd isotope data from the newly identified Eoarchean Nuvvuagittuq supracrustal belt, Superior Craton, Canada". Geological Society of America Bulletin. 121 (1–2): 150–163. doi:10.1130/B26369.1. ^ Mojzsis, S. J.; Arrhenius, G.; McKeegan, K. D.; Harrison, T. M.; Nutman, A. P.; Friend, C. R. L. (1996). "Evidence for life on Earth before 3,800 million years ago" (PDF). Nature. 384 (6604): 55–59. Bibcode:1996Natur.384...55M. doi:10.1038/384055a0. hdl:2060/19980037618. PMID 8900275. ^ Van Kranendonk, Martin J. (2012). "16: A Chronostratigraphic Division of the Precambrian: Possibilities and Challenges". In Felix M. Gradstein; James G. Ogg; Mark D. Schmitz; abi M. Ogg. The geologic time scale 2012 (1st ed.). Amsterdam: Elsevier. pp. 359–365. ISBN 978-0-44-459425-9. Egel, R.; Lankenau, D.-H.; Mulkidjanian, A. Y. (2011). Origins of Life: The Primal Self-Organization. Berlin Heidelberg: Springer-Verlag. pp. 1–366. doi:10.1007/978-3-642-21625-1. ISBN 978-3-642-21624-4.